Pop'n Music 10 features 34 new songs, with a total of over 300 songs. There are 5 modes in this version: Normal Mode, Challenge Mode, Battle Mode, Expert Mode and Osusume Mode. Gameplay is identical to other games in the series. 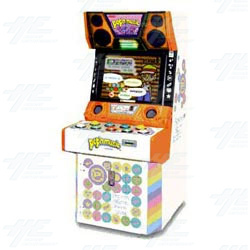 The Pop'n Music controller features 9 buttons organised in two rows. After you select a song, the screen will show 9 coloured "pop notes" descending towards the timing bar. You must watch the screen, and hit the corresponding coloured buttons in time with the music and the notes on the screen. Pop'n Music 10 features 34 new songs, with a total of over 300 songs. There are 5 modes in this version: Normal Mode, Challenge Mode, Battle Mode, Expert Mode and Osusume Mode. Gameplay is identical to other games in the series. The Pop'n Music controller features 9 buttons organised in two rows. After you select a song, the screen will show 9 coloured "pop notes" descending towards the timing bar. You must watch the screen, and hit the corresponding coloured buttons in time with the music and the notes on the screen.